We learned early on our purpose was not to save the world. Yeah, it was a letdown – no cape, no tights. But we soon realized being able to make people’s life experiences more memorable and enjoyable was very satisfying and better matched our skill set. When training our new crew, we tell them to watch a child’s face as the inflatable fills with air. They quickly understand that look of awe and excitement is what our work is really about. More than providing party rentals and performers, we offer people the opportunity to be amused, get excited and play together; to relive those moments when you saw life as amazing and you reveled in it. Now, add in a few more people and it becomes a shared social experience. New friends are made, families come together and co-workers unite. A spark of community emerges . . . huh, maybe we are trying to save the world….one event at a time. Make it memorable with Merry Makers. Whether your event is a company picnic, customer appreciation day, employee team building activity, product promotion or corporate meeting, we have the experience and the resources to make your event a success. We have corporate quality indoor and outdoor amusements designed to entertain your guests, build community and enhance employee satisfaction. You can count on Merry Makers for your success! Play and interaction are a vital part of community building. Churches, festivals, non-profit organizations and other groups have seen the benefits of creating a fun atmosphere for their guests. 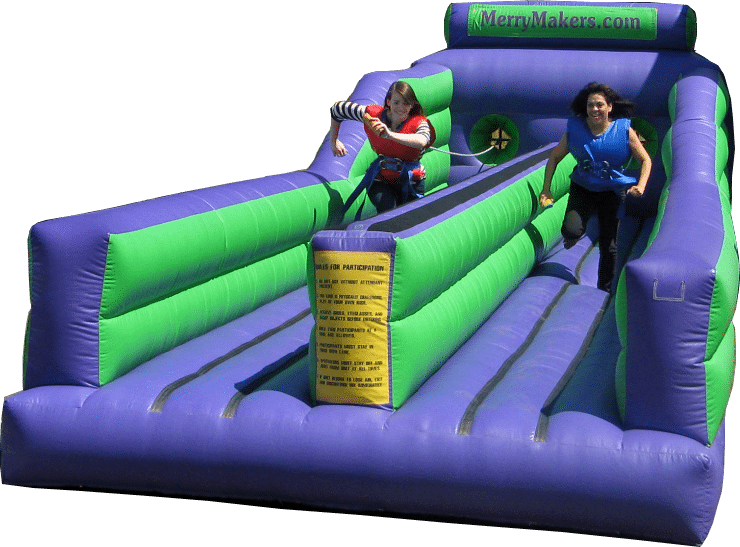 Merry Makers inflatable and party rentals are like a huge welcome sign to draw crowds to your community event. Include performers like airbrush face painters and balloon twisters for the personal level of entertainment. 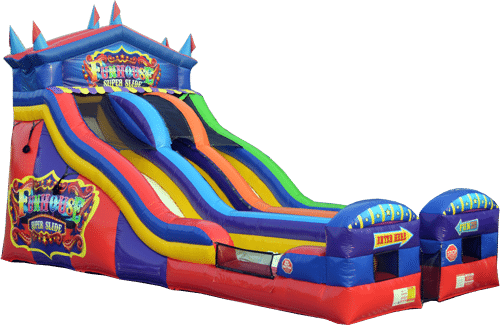 Planning a school carnival, field day or graduation party just got easier with our huge selection of party games, services and concessions. 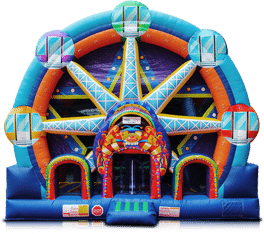 In addition to our popular inflatable attractions, we also offer NON-RIDE inflatables and equipment rentals like the huge Fun House Maze, 9-hole mini golf and sports games. We’ll help you meet your budget and select the appropriate equipment. Rest assured, our equipment has passed the Washington State inspection, we carry liability insurance and our crew members have passed a thorough background check. We’re all about celebrating life’s moments. Certainly, birthdays are the most popular type of celebration, but we provide party rentals to all types of private and public celebrations including weddings, holiday parties, reunions, sports teams events, adoptions, and so many more. If there’s a celebration, we have something special to enhance the experience and make it memorable. 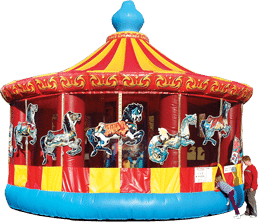 Peer inside to see the wide variety of party rentals we have for children’s birthday parties, teen parties and adult parties. The Ultimate in Interactive Attractions: Meltdown! This ultra-challenging game makes you pay for your bad timing and weak jumping skills with a quick swing of its boom logs. 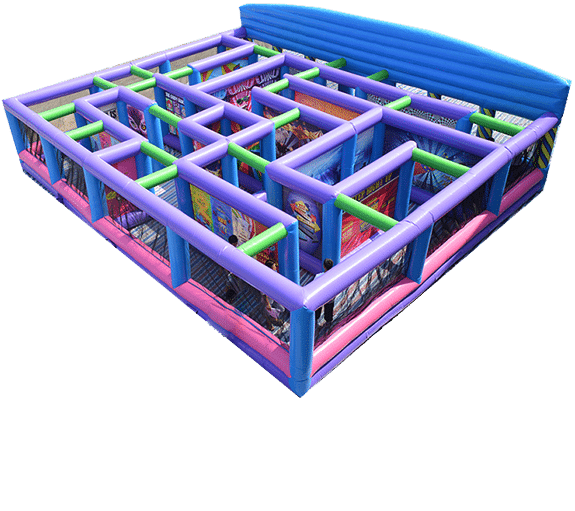 Jump over or duck under the booms as it spins one way, then reverses direction leaving players ‘wiped out’ on the inflated floor. Twists Turns & Dazzling Graphics. The twists, turns, and eye-catching graphics will keep you entertained while you try to find your way out. The floor is not inflated which allows easy access for every age, size and mobility level. Add some decorations and it could be a scary haunted house maze or indoor ‘non-corn’ maze in the fall. It is only limited by your imagination! 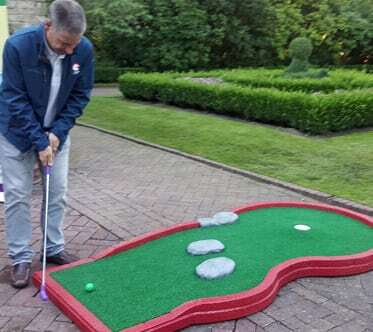 9-hole mini golf is great fun for all ages and skill level. These are the highest quality found in a portable set. Contoured holes with bumps and obstacles will test your putt-putt ability. Includes 3 sizes of clubs, colored balls and scorecards with pencils. Need a full 18 holes? Call us to check availability. Challenge your friends and co-workers to a race, a competition or a fun time. These inflatable games allow adults to play as well as kids. They are perfect for team building activities, grad parties, school events and picnics. 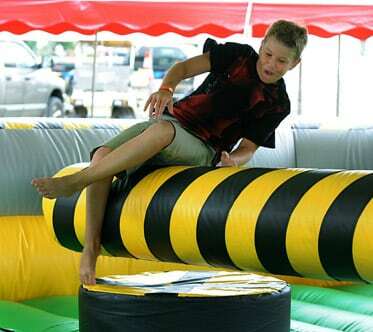 Try the Meltdown, an exciting inflatable to makes you avoid the rotating booms. High throughput is a big reason why these and inflatable slides make excellent rentals. What is throughput? 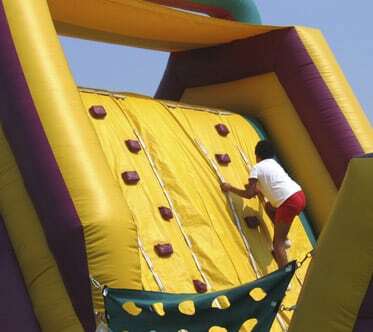 It is how many people can experience the thrill of completing the challenges of the inflatable. High-throughput games are great choices for large events. 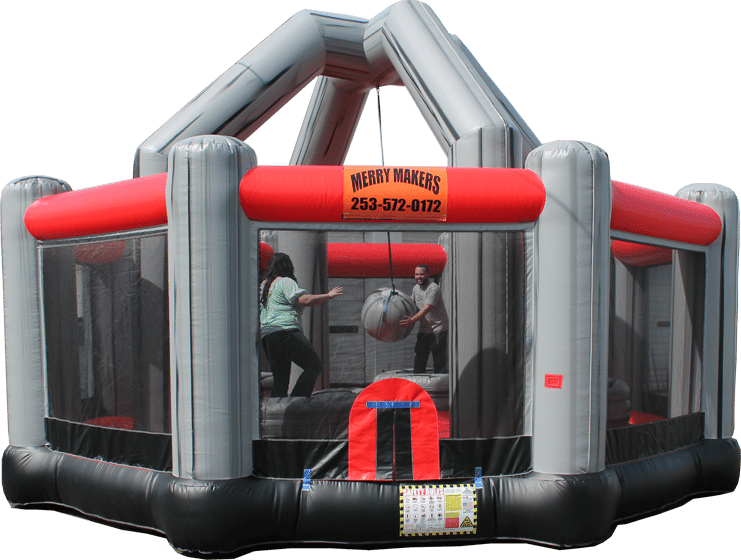 Bounce houses are the classic inflatable rental and we’ve got over 70 styles to choose from and match your theme. Most come with a basketball hoop. 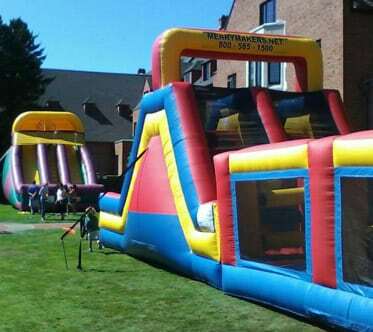 Or, step up to a Combo Bounce House. 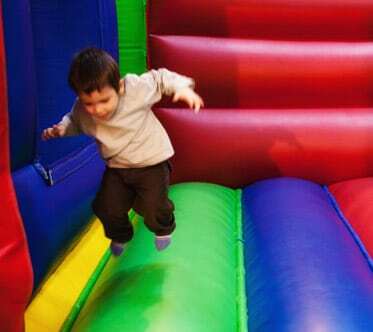 Combos get their name from being a “combination” of the popular bounce house and includes an attached slide. Nothing says “FUN” like slip-sliding down one of Merry Makers water slides! Our combination bounce & slide water rentals are designed for safety while wet. 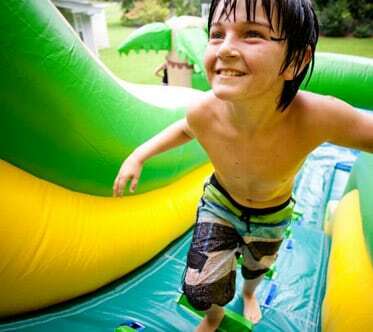 The 22 foot tall Tropical Water Slide extends the fun with an attached slip and slide. Or, suds up and enjoy the mountain of bubbles with our foam party rental. 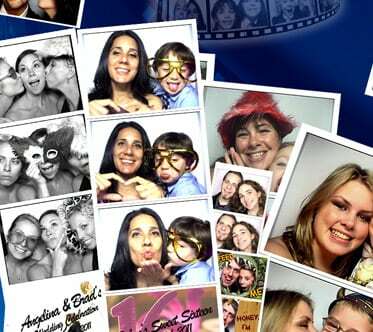 Photo booth rentals are very popular, but our photo units stand out as being different and more interactive. All photo booths give you a photo, but these offer a variety of fun ways to embellish that photo resulting in a unique and personal souvenir of your experience. Performers bring their own type of pizzazz which compliments and enhances your party equipment rentals. Merry Makers began as performers and will continue to seek out the top talent in the NW. 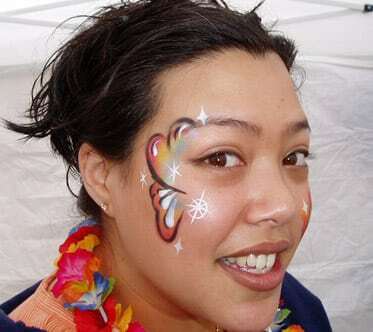 Our most popular request is for Airbrush Face Painting. We paint almost 20,000 faces at the Washington State Fair each year. A winner every time! You have an event, we have a game for it. 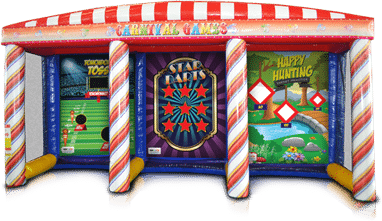 Choose from our collection of carnival game rentals, lawn games, and over-sized games to deliver that extra pop for your party. 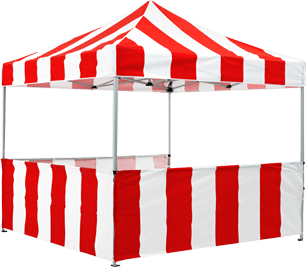 Add a red and white carnival canopy to the game and it becomes an instant party. Rent one or rent them all and create your own carnival midway! Maecenas ullamcorper, odio vel tempus egestas, dui orci faucibus orci, sit amet aliquet lectus dolor et quam. Pellentesque consequat luctus purus. Nunc et risus. Etiam a nibh. Phasellus dignissim metus eget nisi. Vestibulum sapien dolor, aliquet nec, porta ac, malesuada a, libero. Praesent feugiat purus eget est. Nulla facilisi. Amuse: to provide interesting and enjoyable experience. Create: to bring into existence. Excite: to cause strong feelings of enthusiasm and eagerness. These three words are the source of our service and outlook. Our goal is to A.C.E. every event. That means we provide superior customer service, quality party rentals and remarkable performers to give your guests a great experience — as they see it. Some people like to be amused. 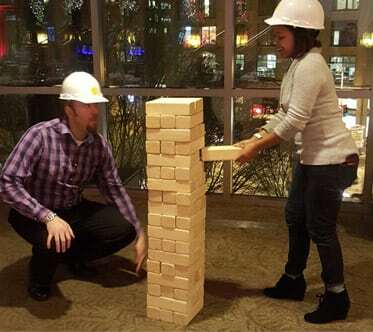 Some like to create social connections and invent new ways to play. Then there are those who will enthusiastically dive in to be the first to try each thing. You bring the people, we bring the fun!